The United States experiences epidemics of seasonal flu each year. This time of year is called “flu season” for a reason. Flu outbreaks can happen as early as October and can last as late as May. The CDC estimates that between 5% and 20% of the U.S. population comes down with the flu each year, and as many as 200,000 people are hospitalized for flu-related complications. The flu introduces some unique challenges for healthcare providers. For starters the flu can be dangerous. For most people it just means a miserable few days, but it kills up to 49,000 people in the US every year. Healthcare providers serve the key role of separating the critical cases from the routine ones. To make matters worse, the flu is also extremely contagious and easily spread. The flu is primarily spread via droplets or spray expelled when the infected person coughs, sneezes or talks. People with flu can infect other people up to about 6 feet away. Symptoms don’t start until 1 to 4 days after the virus enters the body, so an infected person can spread the virus before they even know that they are ill. If you want to avoid getting the flu, a waiting room full of people with coughs and runny noses is the last place you should go. How do you find a balance between providing care for sick patients and slowing the spread of disease? Many doctors are turning to telemedicine software. Patients are seen via secure remote audio and video. Providers can assess, diagnose and subscribe treatment if necessary, all without bringing the patient and their viral load into contact with other patients and clinic staff. Telemedicine technology is great for the patient as well because they don’t have to leave the house or drive while they are feeling so poorly. If they don’t have the flu after all, they have avoided a prime opportunity for exposure. Healthy caregivers are also spared the risk of picking up the virus while at the doctor’s office. 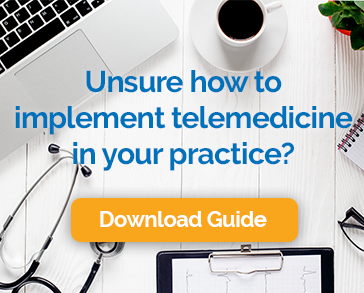 Over the last few years, many states have implemented telemedicine parity laws, ensuring that providers are reimbursed by private payers as if the visit was conducted in person. This important shift has increased the number of physicians who are interested in adopting telehealth software to lessen the impact of flu season. There’s nothing that can ensure that patients are never exposed to the flu, but in conjunction with the vaccine, remote encounters using telemedicine software are a common sense way to combat this annual threat.